After losing over 100 pounds, this patient had an Inner and Outer Thigh Lift with Dr. Ricardo Rodriguez. Dr. Ricardo Rodriguez performed an inner and outer Thigh Lift on this patient in her 60's. 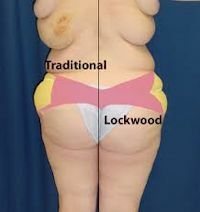 The Thigh Lift removed much of the patient's loose skin that resulted from a massive weight loss (100 lbs). Dr. Rodriguez performed this procedure in Baltimore, Maryland. Patients depicted in our Thigh Lift gallery have provided their written consent to display their photos online. Every patient is unique, and surgical results may vary. Please contact us if you have any questions.